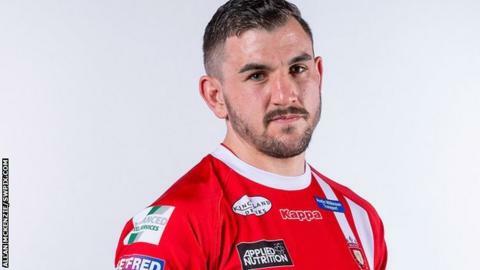 Castleford held on to beat fellow Super League high-flyers Salford in a game which saw Adam Walker make his Red Devils debut after a drugs ban. Walker, back after 20 months out, came off the bench in the 26th minute and was involved in an incident which saw Paul McShane sin-binned for Tigers. Before McShane went off, Jake Bibby ran in Salford's only first-half try after Nathan Massey and Jordan Rankin scores. Greg Eden and Jesse Sene-Lefao tries proved key as Tigers prevailed. Eden's dive into the corner for his seventh try in six games helped put the hosts 18-4 up after 47 minutes, but two tries in four minutes from Jansin Turgut and Joey Lussick gave Salford renewed hope. Sene-Lefao busted through the line to edge Tigers further ahead, with Rankin converting and adding a penalty before Bibby set up a tense finish with the second of his tries. However, it was the incident that came minutes after Bibby's first try that ensured Walker would make a mark in a match that came as a new beginning for the 28-year-old. The prop tangled with McShane in the middle of the park, with the Tiger binned for putting his hands in the face of Walker. Third-placed Castleford's fifth win of the season leaves them level on points with second-placed Warrington. Salford, who a week earlier ran in eight unanswered tries to beat Catalans Dragons in Perpignan for the first time in eight years, remain fourth in the table. Castleford Tigers head coach Daryl Powell: "Mentally we've got a quick turnaround this week against the best team in the comp on Friday so we'll be moving on pretty quickly. "Our boys will have to get their heads right for what is a big challenge for us. We're going to need to step up in terms of quality for next week but we're capable of doing it. "There are weaknesses in any team. The way we play we can open teams up, no question, but you've got to be good against Saints. We've got to be right at our best to find those weaknesses." Salford head coach Ian Watson: "We're really disappointed we've let an opportunity slip. We feel we've let it slip by our own little errors. "But I think we're good enough to compete with these teams now. We just have to believe that ourselves and have the belief going forward. We need to show that next week against Wigan. "We've had a great month - a tough game against St Helens, a game against Catalans away and a tough game at Castleford. We need to come back to the AJ Bell next week and show what we've learnt in these last three games." Castleford Tigers: Mata'utia; Minikin, Foster, Shenton, Eden; Trueman, Rankin; Watts, McShane, Moors, Sene-Lefao, Holmes, Massey. Replacements: Milner, Cook, Egodo, Clarkson. Salford Red Devils: Evalds; Olpherts, Welham, Bibby, Sio; Lui, Hastings; Murray, Lussick, Dudson, Jones, Turgut, Flanagan. Replacements: Griffin, Walker, Nakubuwai, Tomkins.